10.8 x 5.8 x 2.8 cm. A striking, natural bridge-like growth of intergrown, highly lustrous, striated, brassy pyrrhotite crystals from Santa Eulalia. 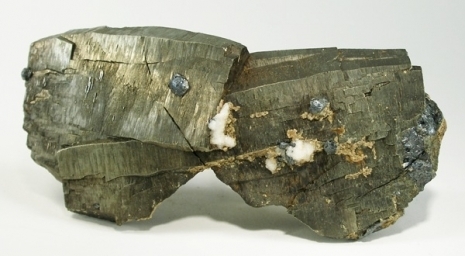 The "bridge" is nicely accented with little clusters of sphalerite and calcite crystals. The left side of the bridge is fully terminated and the right side is partially terminated. Most of the back is also crystallized. Classic, older material from the 1960s or 1970s from the San Antonio Mine and the Consie Prince Collection. Rare in this quality, and old material from the 1950s-1960s.